farmers Market, which seems to be connected to something called Sunflower Farmers Market. The second was Sprouts Farmers Market, which is headquartered in Arizona, with additional locations in California, Colorado and Texas. I find it interesting that both of these companies call their stores Farmers Markets. They seem to be capitalizing on the popularity of farmers markets right now, but I think it stretches the notion of what constitutes a farmers market beyond all recognition. They were almost identical in size, setup, and the products they carried. They were both reasonably priced, definitely cheaper than Whole Foods, which seems to be the market after which they are going. Both had surprisingly small organic sections, and neither seemed to have much in the way of local products. I could be wrong, after all I spent less than an hour at each store, and while I would probably shop there some if I lived in the area (both were cheaper than Whole Foods and did have bigger bulk sections), given that they are both national chains I don't see any indication that they support local, sustainable products. The third place we went was the Wheatsville Food Coop. I was aware of it way back in the late '70s when I lived in Austin, and I even went shopping there once or twice with my housemate, but it was mostly a lot of fresh fruits and vegetables, and I really didn't know what to do with them in those days. I was happy to see that they are not only still around, but seem to be thriving. I was curious to see how much it might have changed so we went for a visit. It was surprisingly similar to Newflower Market and Sprouts, although I guess not really all that surprising, since they are most likely the model those stores are using. Most, if not all, of their produce was organic, so the prices seemed higher, but I think they were decent prices for the market. They were definitely better prices than we have here in Chicago. My sister and I had been discussing greens. 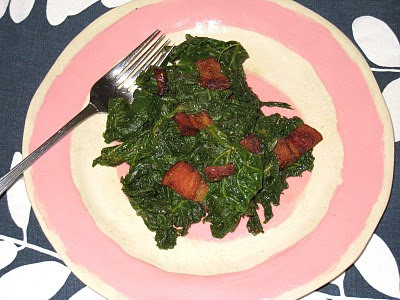 She and her husband had been served mustard greens at a restaurant that they had particularly enjoyed, so she thought she would take a stab at cooking them at home, but she was concerned they might be bitter. I told her I didn't think they would be too bitter, although they did have a bite. Flash forward to the next day, when she reported to me that they were so bitter neither she nor her husband could eat them. She had only cooked them long enough to let them wilt, so he put them back in the pot and cooked them down and she reported that they were much less bitter the next day. The ones she bought also looked a little different to me than the ones I have bought up here. So when I saw how fresh they were at Whole Foods on Tuesday, I threw two bunches into my basket so I could cook them up and see if I had misremembered the bitter factor the last few times I had made them. You can see how fresh these are. I'm sorry to say I have no idea whether or not they are local, but I suspect they may have come from Canada, given that there's French on the label. 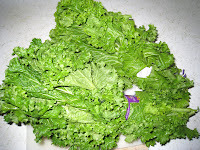 These look lighter than the greens my sister bought, and the leaves are longer as well. I have since read that they are less bitter when in season, and that cooking them longer removes some of the bitterness so I am glad my sister's husband decided to throw them back in the pot so they could enjoy them. I was a little hesitant to use my usual method of cooking these greens because I was afraid they might be bitter. But I decided to move ahead with my method, and they came out perfectly, and not bitter at all. Put the bacon in a large skillet and place over a medium flame. Cook until the fat has rendered out and the bacon is crisp. Remove the bacon from the skillet and place on paper towels to drain. Pour off all but 2 tablespoons of the bacon fat and return the skillet to the heat. Add the mustard and stir to spread the seeds evenly around the pan. When the seeds start to pop, cover the skillet loosely to keep the seeds from popping out. Once the popping stops, add the greens with whatever rinse water is still clinging to them and cook until they wilt down. If necessary, add water a little bit at a time to keep the greens from sticking to the bottom of the pan and to help deglaze the bacon bits. If the greens have not wilted after t minutes or so, make sure there is enough liquid in the bottom of the pan, cover the skillet, and let the greens steam for 5 to 10 more minutes, until they are thoroughly wilted. Add the balsamic vinegar and let cook for one more minute, adding salt and pepper if desired. Remove from the heat and add the bacon. Serve immediately.